It took a lot of bus rides for Rick Kowalsky to get from playing for Simcoe Minor Hockey to standing behind the bench of the American Hockey League Albany Devils but every mile was worth it. Kowalsky was a leader at every level of his illustrious hockey career. He served as captain of the Simcoe peewee team which twice went to the OMHA finals. Brief stints with New Hamburg, as a bantam-aged player, and Simcoe Juniors prepared him for the move to the OHL where he spent four years with the Sault Ste Marie Greyhounds. Ted Nolan, Kowalsky’s coach with the Greyhounds, wrote of Rick, “Having the privilege of coaching Rick in the Sault during our three consecutive Memorial Cup appearances (culminating with a Memorial Cup Championship in 1993) in the early nineties was an honour. Every great team has a great leader and Rick was our captain and leader, Rick demonstrated at an early age that he would make a great coach”. Kowalsky was drafted in 1992 by the Buffalo Sabres but an NHL career was not in the cards. He made his pro debut with the Cornwall Aces (AHL) in 1993-94 and went on to log 183 games in the AHL collecting 56 points and 297 PIM. His professional playing career spanned 12 seasons and included six teams in two leagues in North America. 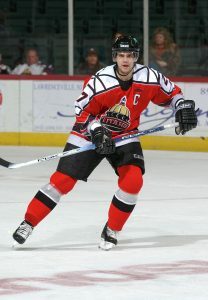 A right winger, he captained the ECHL Trenton Titans to the 2005 Kelly Cup Championship in his final season as a player. He played in the 1995 and 2003 ECHL All-Star games, serving as captain of the North team in 2003. He totaled 221 goals, 329 assists and 979 penalty minutes in 516 regular season ECHL games with Norfolk Admirals, Trenton, and Roanoke Express. He served the Express as player/assistant coach while compiling a career high 83 points in 2001-02. Kowalsky spent the 2005-06 season as an assistant coach with the AHL Norfolk Admirals then became head coach of the Trenton Titans/Devils from 2006- 2010. In August of 2010, he was named head coach of the Albany Devils, the AHL affiliate of the NHL’s New Jersey Devils. In 2009, he was the recipient of the John Brophy Award as the ECHL’s top coach. In 2009, he was inducted into the Norfolk Admirals Sports Hall. Kowalsky was named to the Norfolk County Sports Hall of Recognition as one of the 2010 inductees.